A Year In Chalk: August [C5617] - $5.00 : Yarn Tree, Your wholesale source for cross stitch supplies. Chalkboard your way through the year with the new series A Year In Chalk from Hands On Design. 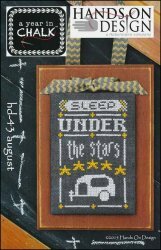 An RV is below the verse "Sleep under the stars". Stitch count 45 x 70.